(Nanowerk News) Scientists from four U.S. universities have created a way to use Rice University's light-activated nanoshells as building blocks for 2-D and 3-D structures that could find use in chemical sensors, nanolasers and bizarre light-absorbing metamaterials. Much as a child might use Lego blocks to build 3-D models of complex buildings or vehicles, the scientists are using the new chemical self-assembly method to build complex structures that can trap, store and bend light. The research appears in this week's issue of the journal Science. Heptamers containing seven nanoshells have unique optical properties. "We used the method to make a seven-nanoshell structure that creates a particular type of interference pattern called a Fano resonance," said study co-author Peter Nordlander, professor of physics and astronomy at Rice. "These resonances arise from peculiar light wave interference effects, and they occur only in man-made materials. Because these heptamers are self-assembled, they are relatively easy to make, so this could have significant commercial implications." The research team was led by Harvard University applied physicist Federico Capasso and also included nanoshell inventor Naomi Halas, Rice's Stanley C. Moore Professor in Electrical and Computer Engineering and professor of physics, chemistry and biomedical engineering. 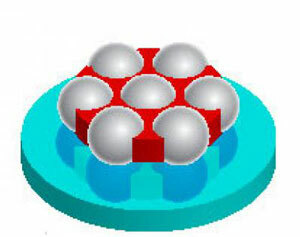 Nordlander, the world's leading theorist on nanoparticle plasmonics, had predicted in 2008 that a heptamer of nanoshells would produce Fano resonances. That paper spurred Capasso's efforts to fabricate the structure, Nordlander said. The new self-assembly method developed by Capasso's team was also used to make magnetic three-nanoshell "trimers." The optical properties of these are described in the Science paper, which also discusses how the self-assembly method could be used to build even more complex 3-D structures. "Nanoshells were already among the most versatile of all plasmonic nanoparticles, and this new self-assembly method for complex 2-D and 3-D structures simply adds to that," said Halas, who has helped develop a number of biological applications for nanoshells, including diagnostic applications and a minimally invasive procedure for treating cancer.